We landed in Panguitch for a week to take in the many natural wonders that are located in this part of Utah… starting with the dramatic Red Canyon and Scenic Byway 12 (which leads to Bryce Canyon National Park, Kodachrome Basin State Park, and Grand Staircase-Escalante National Monument… and continues all the way up to Capitol Reef National Park — though we are saving that park for the next stop on our adventure) and concluding with dazzling colors of Cedar Breaks National Monument and Dixie National Forest. The town of Panguitch itself is quite lovely and a perfect place to put down roots for a week. 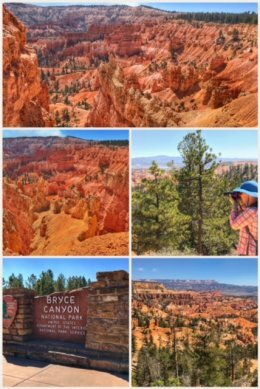 We started the week at Bryce Canyon National Park… and actually spent parts of several days within different areas of the park. Where did we start? At the visitors center, of course… watching the video overview of the park and getting recommendations for hikes. Bryce Canyon, designated a national park in 1928, is one of many parks and monuments located on the Colorado Plateau. Ironically, despite its name, the park is not a canyon but a collection of natural amphitheaters including spires and hoodoos. The park rim sits at a high elevation (8,000-9,000 feet) and the park itself encompasses 35,835 acres. Our first hikes were near Sunrise Point — including walking the Rim Trail and then heading down into the amphitheater on the Queens Garden Trail. 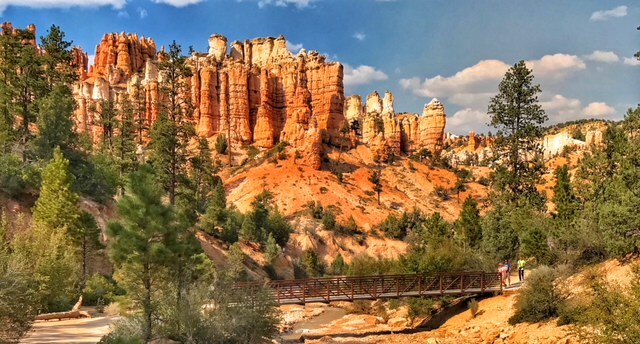 The Rim Trail runs along the entire Bryce Amphitheater — and you can walk any amount of it. 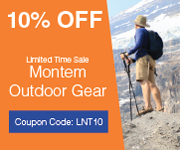 (If you choose to hike the entire trail, it’s 11 miles one way.) The Queens Garden Trail is 1.8 miles one way — and involves a steep drop into the amphitheater (and a strenuous hike back to the top). Because Jen loves fire and Ran was a firefighter — and because we simply love bristlecone pines — we drove out to the farthest point in the park (and closest to the fire) along the 18-mile scenic drive to hike the Bristlecone Loop at Rainbow Point. The 1-mile trail includes cool vistas (even without a wildfire below), as well as a mixed forest of firs and bristlecones (those ancient pine trees). 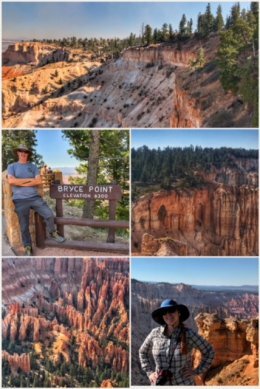 We also visited Bryce Point (perhaps our favorite spot in the park) and hiked more of the Rim Trail. We also visited the Natural Bridge. 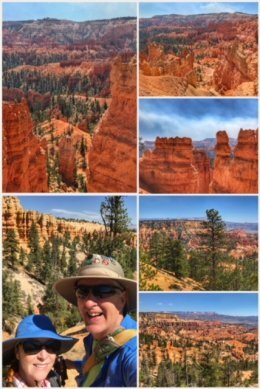 We concluded our visit to Bryce by hiking the Mossy Cave Trail, located on the north end of the park (off of Highway 12), a fairly short (.8-mile) hike along Tropic Ditch (a canal built by Mormon Pioneers), up to a waterfall, and then further up to the mossy grotto. 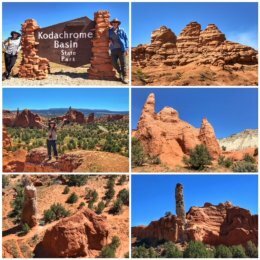 While Bryce Canyon is popular and beautiful, we both had more fond memories for nearby Kodachrome Basin State Park, located outside of Cannonville. Kodachrome, with its 67 colorful monolithic stone spires called sedimentary pipes, offers visitors a much more peaceful and less crowded opportunity to experience amazing geological formations. 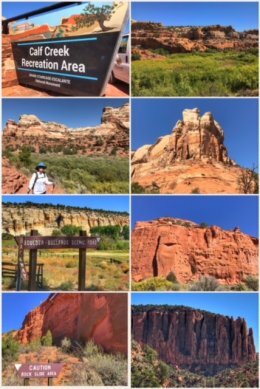 Besides driving around the park, we also hiked the .5-mile Nature Trail (which talks about the plants, animals, and geology found within the park) and the 1.5-mile Angel’s Palace Trail (which offers some pretty spectacular panoramic views of the entire area). But the park in which we spent the most time — and energy — was the amazingly diverse Grand Staircase-Escalante National Monument. We spent three days in different areas of this massive park, hiking down and through two slot canyons and attempting to visit one waterfall. When designated a national monument by President Clinton in 1996, the park included 1,880,461 acres, but an executive order by President Trump in 2017 reduced its size by nearly 47 percent to 1,003,863 acres. The park, managed by the Bureau of Land Management (BLM) consists of three regions: Grand Staircase, the Kaiparowits Plateau, and the Canyons of the Escalante. Our first venture into Grand Staircase-Escalante was to the visitor center in Cannonville, where we discovered the slot canyon hikes. Armed with this knowledge, we headed off for a hike to Willis Creek, located on BLM land adjacent to the Grand Staircase Unit. 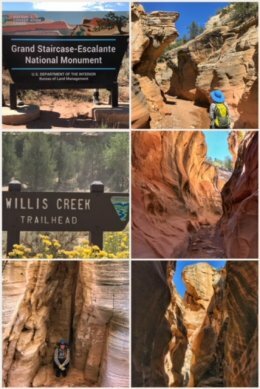 The trailhead is about 9 miles southeast of the visitor center, and the trail itself is a fairly easy (2-mile, one-way) hike along an active creek bed (so wear waterproof shoes/boots) with several beautiful stretches of narrows and high canyon walls, as shown in the collage above. 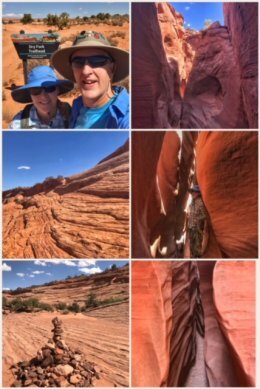 We loved Willis Creek Slot Canyon so much, we decided to head to the Dry Fork Narrows and two other slot canyons — located on BLM land sandwiched between the Kaiparowits and Escalante Canyons units. The bad news is that to get to the slot canyons, one has to drive on a teeth-rattling, super-washboard gravel road for… 26 miles! Ugh. More bad news… you have to hike down some crazy rocky hillsides to just get to Dry Fork (which is completely dry this time of year). The good news? The slot canyons are amazing, though on this day, we left the crowds at Peek-A-Boo Slot Canyon to head to Spooky Slot Canyon, which offers crazy and narrow rock walls, some no wider than 12″ at some points. 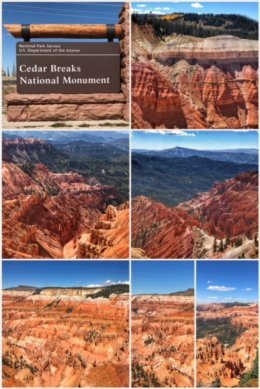 Our last journey on this leg of the adventure was up to Cedar Breaks National Monument, located south of Panguitch (and 23 miles east of Cedar City), near Brian Head. This park is only open May through October because of its high elevation at 10,000+ feet. Originally part of the Dixie National Forest, it became a national monument in 1933 by proclamation of President Franklin Roosevelt. Similar to Bryce Canyon in that Cedar Breaks is a massive natural amphitheater (stretching across 3 miles, with a depth of 2,000 feet) — it provides majestic views of painted walls (of pink, red, purples, and yellows) and is comprised of eroding limestone, shale, and sandstone — but it is much easier to see and experience… and MUCH less crowded than Bryce. Hiking one or more of the trails will let you commune with Spruce (returning after a massive die-off from a beetle infestation that started decades ago) and those ancient Bristlecone Pines. We hiked the 2-mile Ramparts Trail (that goes to Spectra Point and then plunges into the canyon to Ramparts Point (a 4-mile hike)… but most of our time was spent at the four overlooks that are all accessible along Hwy 148 (the six-mile scenic drive). 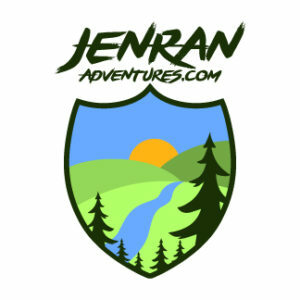 Other hikes you might consider while at this park include the Alpine Pond Trail, Sunset Trail, and Rattlesnake Creek Trail. By the way, there are no cedar trees in Cedar Breaks National Monument. The name comes from a mistake made by early settlers who mistook the many junipers for cedars — and breaks comes from what these folks used to call badlands. Right outside of Cedar Breaks, along Hwy 14, we also hiked a wonderful little (0.6-mile loop) trail called the Bristlecone Pine Trail, which takes you through a deeply aromatic forest to an overlook of the Virgin River Valley, with Zion National Park in the distance. 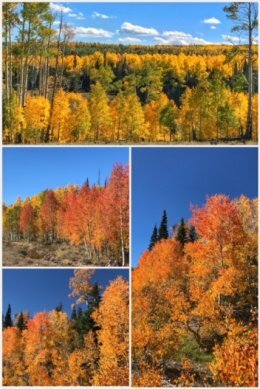 On our way back to Panguitch from Cedar Break National Monument, we continued traveling through the Dixie National Forest and were completely overwhelmed with joy by the vast number of aspen groves turning gold and orange. We had to stop multiple times and take in these beautiful trees — and burn these imagines into our brains. We are loving autumn in Utah — and look forward to comparing these aspens with what we will witness in New England next year. 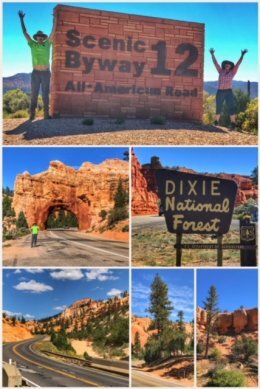 By the way, the Dixie National Forest is the largest national forest in Utah — and encompasses almost two million acres, stretching for about 170 miles across southern Utah. Next up, our adventure in Utah continues with a drive up to Torrey and Capitol Reef National Park. Previous Post:Stop 49: Great Basin National Park – Truly Great!